Today, my dear readers and fellow parents, I look to you for help. I’m a mommy who needs some advice. I have two words for you: Potty Training. Enough said, right? My oldest son is 3 years old and has been potty training for over a year. We had reached a great point right before the baby was born. Amazingly, we didn’t experience any regression when “RJ” first arrived. “G” actually did even better on the potty. Well, “RJ” is now 6 months old and “G” is in potty training rebellion phase. I don’t know what’s going on. He had been peeing on the potty like a champ. No problem whatsoever. He would, however, poop his pants. occasionally he’d poop on the potty but most of the time it was in his underwear. Now, he’s been peeing in his underwear again. I just don’t understand…. We’ve tried everything we can think of to help him along. 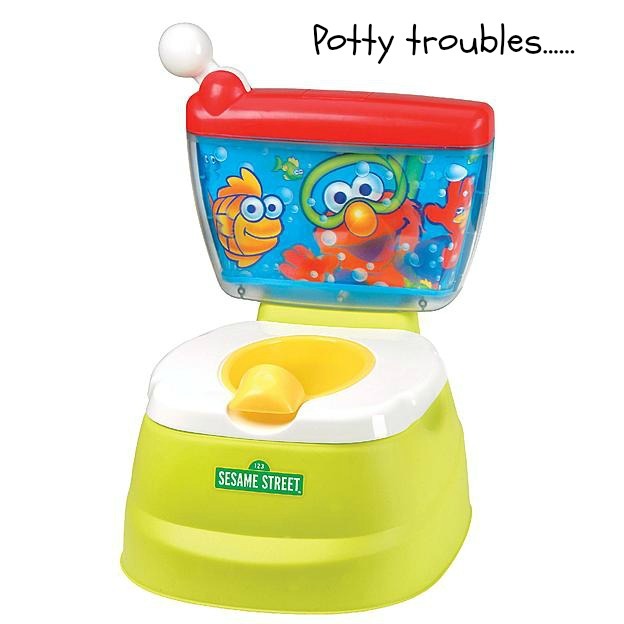 We’ve done a rewards system, a potty chart, taken away TV unless he pees and poops on the potty all day long with no accidents, had him clean up the mess himself, let him sit in it for a while so he’d get uncomfortable, had him watch “Elmo’s Potty Time”….nothing seems to be working. I am at my wit’s end and pulling my hair out. And, really, that’s putting it mildly. I’m trying my best to be patient and not get upset and frustrated with him, but when you also have a 6 month old to care for and your 3-year-old should be fully potty trained by now but isn’t, it gets EXTREMELY frustrating. So, today, I am looking for some words of wisdom from experienced parents out there. What else can I do? Is he ever going to be fully potty trained? 4 Responses to "A cry for help"
Thank you so much for the encouragement and advice! We have been giving him praise but I think lately we’ve been more frustrated and maybe unintentionally backed off giving him as much praise as we used to. I’ll be sure to pile more on now. Thank you!! YES, G will be potty trained!!! That I guarantee. 🙂 I know it can be quite stressful until then, especially if there is some willfulness about his not getting with the program. Super important: Try not to show your concern at all. Really, not at all. Kid-radar picks up on this immediately and can exacerbate the problem. No discussion about it if he poops in the wrong place. Just take care of it without showing any annoyance, engaging in normal, neutral conversation as if nothing out of the ordinary happened. Then, at the times he does succeed in pooping in the potty, ladle on the praise generously. Not reacting to a “mis-poop” isn’t easy, but I feel it’s a critical piece. If he is discovering at this young age how to receive gratification through negative attention, it needs to be ‘nipped in the bud,’ as Barney Fyfe would say. My granddaughter is 11 months… nowhere near potty training yet. But even at this age, she’s super alert to parent reactions. When she has a particularly messy diaper, her parents’ (and her grandma’s!) tendency is to exclaim, “Uh-oh! Oh, no!” I can it see in Ara’s eyes, a little sense of alarm, like she’s trying to understand her parents’ dismay, “What did I do to cause this reaction and should I be upset, too? Am I ok?” These dear little ones are like emotional sponges. They will absorb it all and process it as best they can. One more thought… I don’t know if this fits with your dietary routines, but Brett reminded me just last week as we were talking that I used to reward her with one M&M – just one – each time she succeeded on the potty. I had forgotten this potty training tactic of mine until she mentioned it, but she actually remembered it! It must have left an impression on her. If M&M’s are a no-no in your household, perhaps some other very small, but special treat would work. I feel for you, Leah, and will pray for you as you walk through this mommy challenge. I hope that your sweet little “G” gets on board soon. If you are ever in the neighborhood and have a few moments, please stop by CHA. We’d love to see you and your kids and catch up! Hi Janis! I miss you guys too! Thanks so much for the advice! 🙂 I will be sure to put all of that into practice! I’ll try and stop by CHA soon, once the weather is more consistently nice out.